The contract to build the railroad line connecting Nashville, GA by way of Rays Mill (now Ray City) to Valdosta, GA, might not seem like a project that would attract one of the largest construction companies in America, but the 1907 call for bids for construction of the Georgia and Florida Railroad did just that. To be fair, the total contract concerned not just the 30 mile stretch of railroad from Berrien to Lowndes county, but about 70 additional miles of track to connect the various shortlines that comprised the Georgia and Florida railroad. 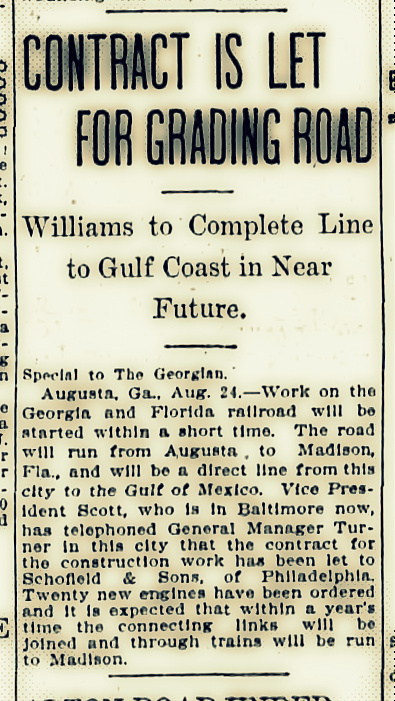 Perhaps the most prominent bidder for constructing the connecting lines of the G & F was William J. Oliver, the Tennessee contractor who earlier that year had submitted the lowest bid for the immensely huge task of constructing the Panama Canal. Oliver expected that the South Georgia cotton shipped over the Georgia and Florida Railroad would eventually find its way through the Panama Canal to meet the demand in Asian markets. When completed, the G & F line would certainly open the way for economic development in Berrien County, GA and fuel the growth of firms such as the Luckie Lumber Company at Ray City, GA.
William Jesse Oliver (1867-1925) was a prominent bidder for the contract to construct the Georgia and Florida Railroad. In 1907, the early accounts indicated Oliver had a lock on the canal contract. January 28, 1907, William J. Oliver to build the Panama Canal. 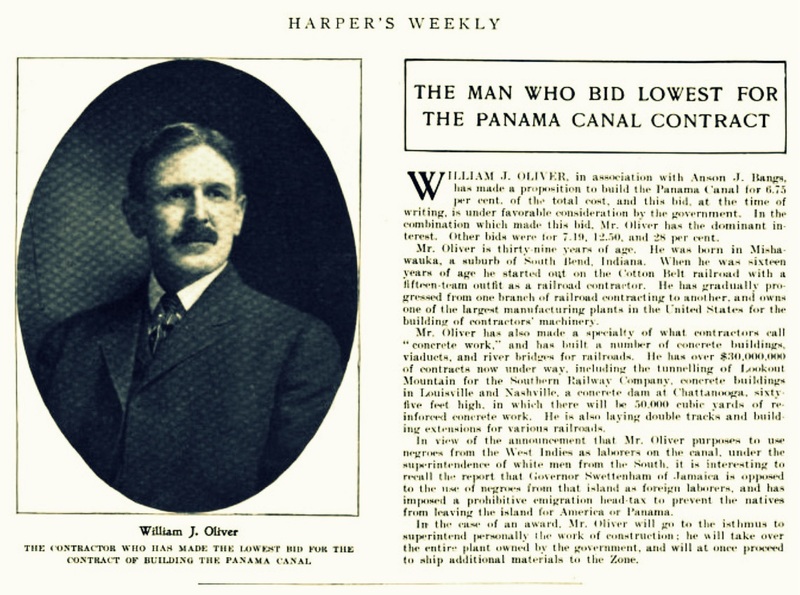 The first week of February, 1907, Harper’s Weekly Magazine gave a short sketch on William J. Oliver and his bid for the Panama Canal. 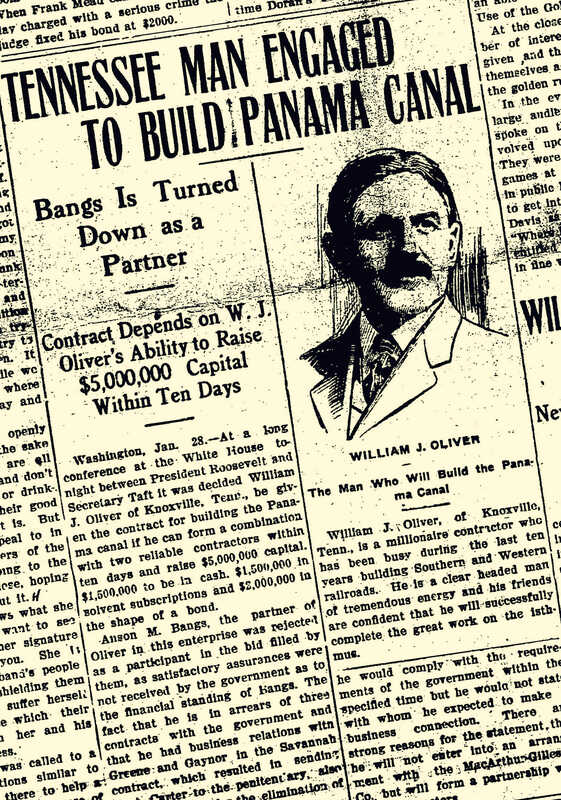 William J. Oliver, in association with Anson J. Bangs, has made a proposition to build the Panama Canal for 6.75 percent, of total cost, and this bid, at the time of writing, is under favorable consideration by the government. In the combination which made this bid, Mr. Oliver has the dominant interest. Other bids were for 7.19, 12.50, and 28 per cent. Mr. Oliver is thirty nine years of age. He was born in Mishawauka, a suburb of South Bend, Indiana. When he was sisteen years of age he started out on the Cotton Belt railroad with s fifteen team outfit as a railroad contractor. He has gradually progressed from one branch of railroad contracting to another, and owns one of the largest manufacturing plants in the United States for the building of contractors’ machinery. 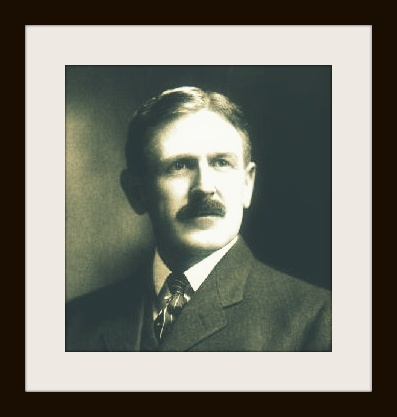 Mr. Oliver has also made a specialty of what contractors call “concrete work,” and has built a number of concrete buildings, viaducts, and river bridges for railroads. He has over $30,000,000 of contracts now under way including the tunnelling of Lookout Mountain for the Southern Railway company, concrete buildings in Louisville and Nashville, a concrete dam at Chattanooga, sixty five feet high,in which there will be 50,000 cubic yards of reinforced concrete work. He is also laying double tracks and building extensions for various railroads. In view of the announcement that Mr. Oliver purposes to use negroes from the West Indies as laborers on the canal, under the superintendence of white men from the South, it is interesting to recall the report that Governor Swettenham of Jamaica is opposed to the use of negroes from that island as foreign laborers, and has imposed a prohibitive emigration head tax to prevent the natives from leaving the island for America or Panama. In the case of an award, Mr.Oliver will go to the isthmus to superintend personally the work of construction; he will take over the entire plant owned by the government, and will at once proceed to ship additional materials to the Zone. Ultimately, the contract for construction of the Panama Canal went to the Army Corps of Engineers. Oliver said he had been “whangdoodled” by President Teddy Roosevelt, but his manufacturing company did end up supplying some of the construction equipment. The completed canal is still regarded as one of the greatest engineering achievements of the modern world. May of 1907 found Oliver not in the Canal Zone but in Augusta, GA to bid on the G & F construction project. In the May 20, 1907 edition of The Atlanta Georgian and News, he was still protesting the politicized award of the Panama Canal contract, but the paper also reported his comments on the global impact of the opening of the Georgia and Florida Railroad. “When this line is completed,”he said, “it will largely solve the problem involved in the big suits now before the interstate commerce commission in the matter of rates from the South to Oriental ports. All the cotton goods and other freight that must cross the Pacific will go over this line and through the Panama Canal when it is finished,” he said. The Atlanta Georgian and News reports William J. Oliver will bid on the construction of the Georgia and Florida Railroad. 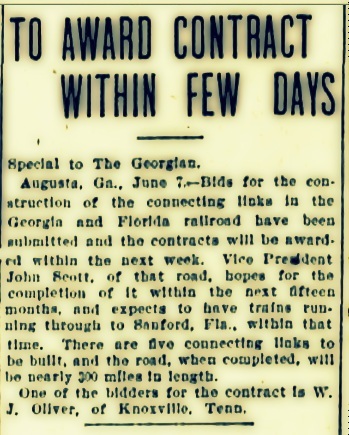 Within a few weeks, The Atlanta Georgian and News reported that The Georgia and Florida Railroad was ready to select a contractor. By June of 1907, the selection of a contractor for construction of the Georgia and Florida Railroad was imminent. But the bids came in too high and on June 22,1907 the railroad announced it would hold off on awarding a contract. 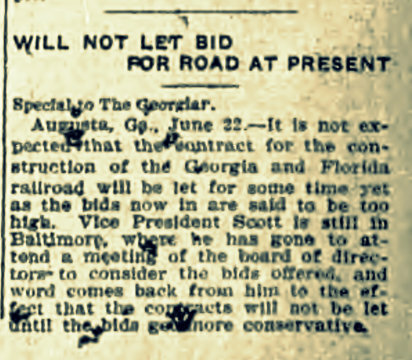 June 22, 1907 The Atlanta Georgian and News announced that the Georgia and Florida Railroad would not be letting a construction contract for some time. On August 24 the contract was finally awarded, but went to Schofield & Sons of Philadelphia. August 24, 1907, the Georgia and Florida Railroad contracts for construction of new line. -So in the end, the man who famously did not get the Panama Canal contract, also did not get the Georgia & Florida railroad contract.